Bravo Store Systems LLC. is a leading SaaS provider of integrated Point-of-Sale and inventory management solutions. The company has been working with AltexSoft for over 6 years, developing its cloud-based pawn software platform. The solution is a complex cloud platform, providing effective pawnshop administration tools. To extend the reach and offer more opportunities to its customers, the Bravo team wanted powerful eCommerce features integrated within the platform. AltexSoft was contracted to complete the project. 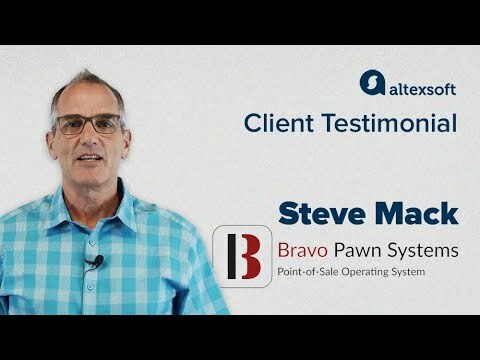 Adding eCommerce capabilities to the basic POS functionality of the Bravo System was a way to introduce the company to internet retailing opportunities, and add more value to its business proposition. Pawnshop owners would be able to grow their reach and get efficient tools to streamline their merchandise. As a result of the team’s effort, AltexSoft was able to deliver the following additional benefits to the client’s core product. AltexSoft team integrated the eBay API in order to provide the Bravo users with direct access to its listings. The users can create auctions or upload their inventories to the “Buy it Now” section with a single click. This increased the average gross margin by 9%, as compared to the previous versions of the system where the users had to manage their sales manually. Integrating with eBay listings alone resulted in 6.7% profit growth for Bravo users. Apart from eBay integration, Bravo eCommerce capabilities allow users to reach out to potential customers using such platforms as Craigslist, Buya (exclusive Bravo secondhand marketplace), Gunbroker and Amazon. The system allows the manager to keep the listings in sync with the Bravo inventory. This adds extra value to the company offerings and allows users to sell more. Bravo system helps the users drive traffic to their sale items, with social sharing and optimized listing content. The AltexSoft team used Facebook, Twitter, Pinterest, and Google+ APIs to let the users promote their Buya listings on social media. Moreover, the system automatically generates HTML files with optimized content (item description and parameters) that can be used on any third-party listing platform, so the items on sale are ranked higher in search results. C#, Microsoft .NET, and MS SQL Server. In addition, the team integrated a number of third-party APIs into the system – eBay, Craigslist, and Amazon. It took the team 18 months to introduce this functionality.